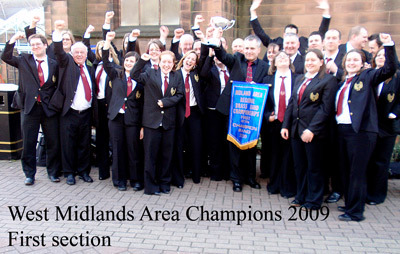 March 2009 What a start to our year, West Midland Area Champions at only the second time in the first section. The test piece PENTACLE by Graham Cole proved a very demanding challenge, but under the inspired leadership of our musical director Dai Maplestone, the band rose to the challenge to play a superb performance to earn a well deserved first place at Bedworth Civic Hall on Saturday 14th March. It was a tremendous team performance which earned a standing applause from the composer of the piece Graham Cole. We also owe our win in no small terms to our friends at the Cradley Heath Salvation Army; for a few years now we have been doing a "run out" of the test piece at a concert at the Army Citadel a couple of weeks before the contest. Although we still had a lot of preparation time for the contest, this "run out" provided a valuable basis on which to continue our preparation. We will now be going to Harrogate in September for the National Finals (again) and next year we will be promoted to the Championship Section; watch out Black Dyke. Only kidding, but who knows, the band has exceeded all expectations up till now, so lets hope we can continue with success. May 2009 Saturday night 27th May, the band held a quiz night to help raise funds for Harrogate. Lisa's mom and dad did most of the work with Frank organising the quiz and Leda doing the food. We had a great night with Dave Jenks our drummer leading the winning team with an astonishing 85 points out of 105. £300 was raised for the funds so a big thank you to Lisa, Leda, Frank and Janet for all their hard work in putting on this event. We attended the Buxton spring contest, the first time here since 2002. Because of preparation time , or lack of it, we chose to play Eric Ball's Resurgam again, this time however, we were up against much stiffer opposition than at Leamington. We put on a fine performance and were awarded 3rd place. We had to do a bit of shuffling around as our solo horn was away so the lower horns were promoted for the day and did a superb job lead by Becky Williams on solo. We also had a few deps to cover other absentees, so thanks to them all. We now start work on our next major event which is our own summer concert at Netherton Art Centre on June 27th where we look forward to another sell out. Saturday June 27th was our annual concert at Netherton Art Centre where we put on a concert with a "difference". Following our recent successes in the contest field, there was an inspired idea to do a concert to celebrate, and an arrangement for band of a number of "big band" swing tunes entitled "Swing When Your 'e Winning" was chosen as the basis for the concert theme. We decided we would do the entire second half based on swing numbers, an to replicate the authenticity we set out the band seating in the manner of the "big band" era. This was a risky plan; but it worked, we had a great time and from the feedback we received so to did the audience. A big thanks go to our second Horn Claire Stone for her design of the stands and the programme. But thanks are due to many of our supporters who did a great deal to make this concert such a success . Our next major event is at the Telford Festival of Brass on July 18th where we will be doing an afternoon performance, and also at the evening Gala Concert. 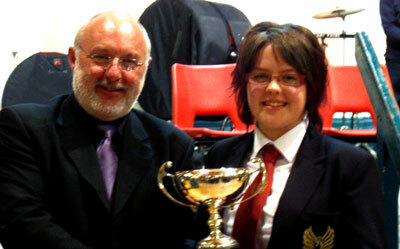 We decided to compete at Wychavon Festival of Brass at Droitwich, in the 1st section. We were awarded 2nd place. This was an entertainment contest with an own choice programme of 20 minutes, but we went over time and were deducted penalty points. This meant that had we not gone over we would have won! Here we are again at Harrogate for the finals of the National Champions of GB in the 1st section. Competing against the top 16 bands in the country. It was not to be our day, we did not really perform to our potential, so as a result we were given only 15th place. We were naturally very disappointed but we remain upbeat and will learn from this as we prepare for our next year in the top section. The evening before the contest we had our annual awards dinner, but this year we hired a local community centre and the dinner was prepared by Lisa's mom and dad, Leda and Frank, and what a brilliant job they did, so a giant thank you to them both. The awards were chosen by our MD, Dai Maplestone; he awarded Lisa Jenks as the player of the year and to the most improved player of the year to Claire Stone; so congrats to them both for their hard work and commitment to the band. 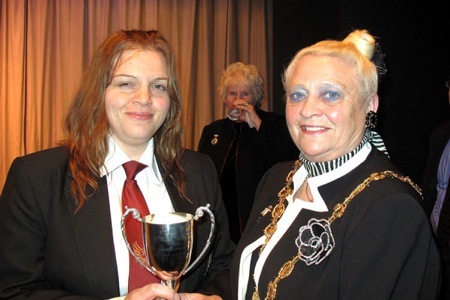 For the first time this year members of the band were asked to vote for their Bands person of the year; the vote was given to our principle cornet and very hard working secretary Lisa Jenks, so once again congratulations to Lisa.